2017 has started with a rush and we want to make sure that you’re kept up to date. So aside from exhibitions and our on-going focus on enriching the social history of the UWI, we are collaborating on a January 27 UWI and the 1960s event with our colleagues at the Department of History & Archaeology; and we are engaging with a project to spread skills on 3-D and spherical technologies as they apply to museums. The 3-D workshops are part of a project undertaken by the University of St Andrews, UK with European Union support. Facilitators Dr Karen Brown and Dr Alan Miller note the great potential that digital technologies have for museums, and their increasing affordability through the use of commonly available technologies like mobile phones, tablets and cameras and freely-available open source software. The University of the West Indies (UWI) is engaging with the EULAC project through its campuses at Cave Hill, Barbados, St Augustine, Trinidad & Tobago and Mona, Jamaica. In Jamaica, we’ve also invited the involvement of the Institute of Jamaica system and the Charles Town Maroon Museum. The UWI Museum is the site of one of two mid-January workshops which the facilitators note can “provide a practical guide to working with 3D and spherical media and how they can be used in Museums.” The focus is on techniques and workflows for creating and using digital artifacts and scenes. A second workshop will be held at Charles Town, Portland. Just a few days later, we will join with our UWI and the 1960s partners, the Department of History & Archaeology/Social History Project to host a local premiere of the new documentary feature on iconic Caribbean activist and author CLR James. James was born 4 January 1901 in Tunapuna, Trinidad and died in London, UK in 1989. He is perhaps best known for Black Jacobins and Beyond A Boundary. He visited and spoke at Mona in the 1960s, and was awarded an Honorary Degree by the UWI in 1971. The St Augustine Main Library has an important CLR James Collection and a cricket studies building at Cave Hill is named in his honour. The WORLDwrite film that was developed using crowdfunding and hundreds of volunteers, will be introduced by CLR James Estate executor Prof Robert Hill. 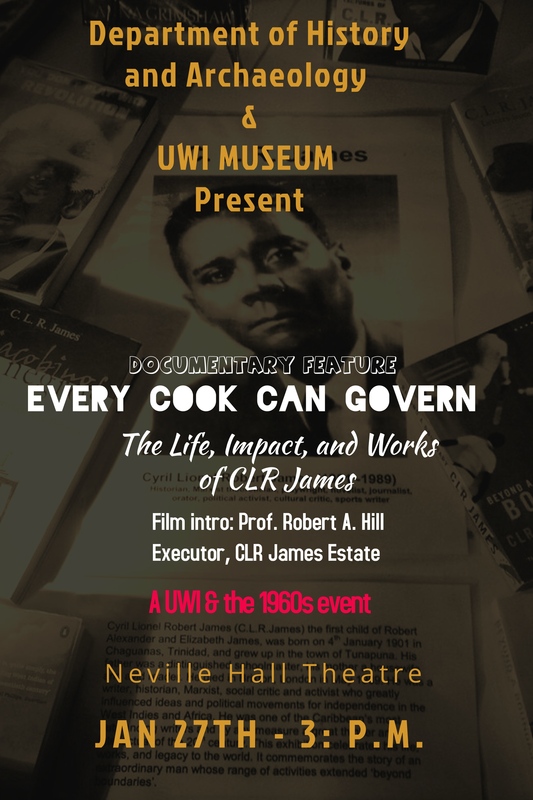 The film is titled Every Cook Can Govern: The Life, Impact & Works of CLR James, after an essay James wrote in 1954. The venue is the N1 Lecture Theatre on the UWI Mona Campus at 3pm on Friday 27 January. We are also developing a small pop-up exhibition on James’ connections to the UWI, so let us know if you have anything to contribute. UWI and the 1960s is an occasional series in which the Museum and the Department join in interrogating the university’s connection to iconic movements and people of the dynamic 1960s period.